Living in South Florida does not allow us the opportunity to enjoy a hot adult beverage very often. Our temps dropped today to a balmy 39F and it was time to try out something warm and yummy. This recipe is a double and contains a batter that you must make. 3 oz. Virgin Island rum- Cruzan dark works great. 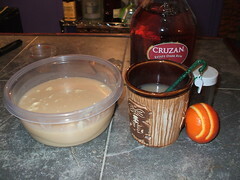 Add the rum, cloves, Tiger cream, orange peel and slowly pour the hot water in the mug. I liked using a straw so you are not constantly getting the cloves in your mouth. This makes a large batch of cream and will last a few weeks in a tupperwear container. Cream all this gooey mess together and you have one tasty sticky mess.